I bought this blanket in a twin-sized charcoal gray, and I like everything about it. The color, texture, weight and weave are just right. It was generous in size. I machine-washed it in cold water, and dried it in the dryer. It did not produce an excessive amount of lint, and it did not shrink at all. I highly recommend this blanket. Perfect for snuggling up on a cold night, this Grand Hotel throw blanket will bring soft luxury to your home. The blanket is crafted from 100-percent cotton with a basket weave that lends an appealing texture to the warm and cozy design. This stylish blanket is available in a variety of sizes and trendy colors. While talking to my Dad one day he was telling me how hard it was to find a 100% cotton blanket. I checked several sites and was impressed with the price of this blanket on Overstock.com. I found several on other sites that were 2-3 times more costly. I ordered one for him for Christmas and at this price I thought I should order one for myself as well. The order was delivered quickly. I opened one and was impressed with the texture and weave. Prior to using it, I washed and dried it. Upon taking it out of the dryer, I was totally impressed with the way the blanked "thickened" up. It was easily 3 times thicker. I put it on the bed and am shocked at the weight of it and how warm it is. I like to sleep in a cold room but this blanket prevents that. I am 100% satisfied with this purchase. 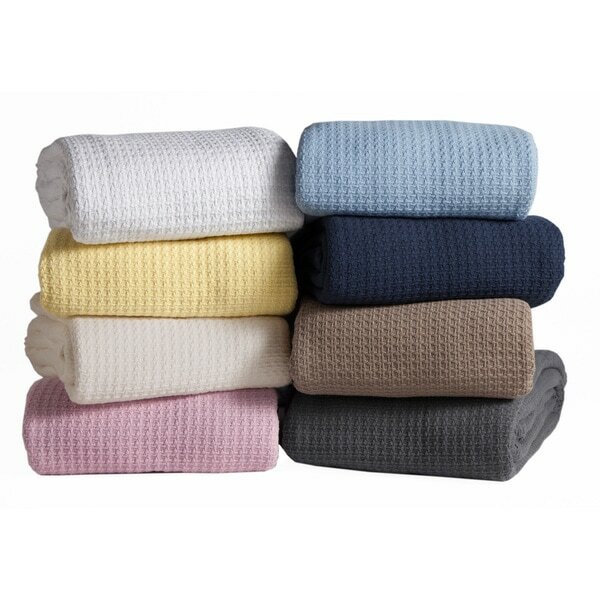 If you are looking for a comfortable, high quality cotton blanket, buy this one. You won`t be disappointed. ***WARNING*** Clean your lint trap before drying. You will find a ball of lint about the size of a softball after drying this blanket. Of course I have a king size blanket. Not at all the quality I imagined, but that's what can happen when you order online. BUT the packaging indicates this product to be 90 inches by 90 inches. I measured it, and it is only 60 inches by 90 inches. Learn to count! I would not recommend this product. I just purchased this Grand Hotel blanket. It looked beautiful in the package. I washed it before using it and I have washed it two times and rinsed four times and it is absolutely falleng apart with fuzz and strings. I have never had this happen before. Needless to say, I read the refund policy and the item must be sent back unopened or unused......now I doubt that I can send it back because it has been opened. What a horrible policy! Who knew this would happen from just washing a cotton blanket! Save yourself a lot of work....don't buy it! I love this oversize KING blanket. It hangs over 12 inches on both sides. Most blankets hang over 3 inches. Very light and warm. No snags yet from the dogs and cats. We had it for 2 months. Washed beautifully and did not shrink. Excellent buy!!!!! I read the very mixed reviews but decided to try this blanket, recognizing the need for care in washing. I want a 100% cotton blanket and the camel color matched decor in a guest room. I followed the written instructions exactly: washed it in cold water, tumble dried low and even took the extra precaution of removing it to air dry before it was completely dry. The Full/Queen that I purchased says it measures 90" x 90". I didn't think to measure before washing because I trusted it was that size. After the first washing, this blanket now measures 76" x 80". This is unacceptable shrinkage. The ad describes it as "Grand Hotel." However, the tag on the item has no identifying brand; It only says "Made in India" and gives the washing, drying instructions. In addition, the blanket has a faint irregular gray line approximately 2 inches wide that goes nearly across the blanket. This is a cheaply made product that I would never recommend. I said "Yes" on recommending, but with a size qualification. I ordered two Twin size, and due to reviews about shrinkage, washed just one first to compare to the other. The blanket shrunk alot, more than I expected from a cotton blanket- 3" on each side and 3" on the length. Out of the package, the blanket is cut to what you would expect from a finished (and dried!) size for the bed- but I would have only expected about 1" in shrinkage everywhere. And yes it made alot of lint the first time in the dryer, but that is the norm for washing cotton blankets the first time. My blanket JUST fits the bed now, the sides are a bit short for normal Twin size, but since only one person will be sleeping under it, I think it will be fine. But I can understand the concerns about bigger sizes- I would order a Queen size for a Full, etc, since there is ALOT of shrinkage. I think ordering a Full for a Twin would likely be too long on the sides, even with the shrinkage. The quality itself is nice and I noticed no snags out of the package, so I do not think these are seconds as someone else mentioned as a worry. Be sure to heed the Care Label or prepare to do battle with the lint monster. I bought two queen size blankets. A navy (primary) and a taupe (secondary). I was so excited to finally receive the blankets that I just threw the blue in the washer. There was so much lint I was literally freaking out. Before I washed the taupe I decide to check the care label. USE DELICATE CYCLE. Which I did and no excessive lint. As far as drying, no more lint than would be expected. As for the blankets I am very satisfied with my purchase. Both blankets look great on my bed and keep me warm on the worst winter nights. These blankets are definitely one sided, which I guess is why they are consider a throw blanket. These seem to be study blankets and the pattern fits in with most décor. If I were to grab a blanket to keep me warm I'd grab one of these. That said I plan to buy a couple of twin sizes just to keep on the couch for a throw. If you buy one or more of these blankets you will not be disappointed. Well unless you do not heed the care label or you are just hard to please. Don't pay attention to those who complain about lint in the dryer, that's what these blankets are SUPPOSED to do. They must be washed and dried for the loft to become LUSH. This is one of the best deals I've found. Alot of blankets are still wimpy after washing ....NOT THIS ONE!! I got the soft blue, the color holds and is very substancial. I plan to buy several more as gifts (if I can bear to give them away!) GO for it, you WON'T be sorry. It is actually 90"x 90", nice texture, looks good, and most of all it is warm. Knowing that 100% cotton will shrink, I ordered a king size for a queen bed. I washed it in hot water and dried it. It shrunk 4 - 5 inches both ways as I expected. I would order this again if I need blankets in the future. DO NOT BUY THIS! I washed this blanket as soon as it arrived as I do all my new bedding and when I took it out I noticed that the washer was full of lint! I put it in the dryer and checked the lint trap literally 3 minutes later and it was FULL! I checked it every 3 minutes and each time it was FULL of heavy lint. When it was finally dry it was covered with pilling and lint. WHAT A MESS!! A nice blanket but a bit more loosely woven than I was expecting, so it snags relatively easily. Also the "Ivory" color that I ordered is more of a Camel color than I had in mind. I purchased this blanket with high expectations as I am going more organic with all my home goods especially bed clothes. When I received my blanket I opened it and washed it and was so looking forward to making up my bed. O MY GOODNESS!!!! When I went to the washer to get it out I couldn't believe my eyes! The washer was full of lint! Big chunks of lint!! I had to take the balnket outside to shake the remaining lint off the blanket before I put it into the dryer! This was a nightmare! Then I put it into the dryer and had to remove lint from the filter 5 times!! Do not purchase this blanket! I had no choice but to dry it and I did put it on my bed. It is warm, but I will be afraid to wash it again! I do not reccommend this item. I know I could have returned it but that is a hassle because it was packaged at the manufacturer and we all know how hard ir is to repackage. Buy at your own risk. I actually bought this blanket just about 3 years ago. My husband and I used it daily for all that time on our full-sized bed. I came back because we recently upgraded to a king-sized bed and I wanted to buy this blanket for our new bed. I saw some negative reviews for this, so I thought I'd weigh in. I'm reviewing the full-sized blanket I have used for three years. I admit that when I wash and dry this, I get a lot of lint in the lint trap. But this blanket has stood up through three years of washing and drying. It's a little thinner than when I first got it, but It's still a nice blanket. It hasn't fallen apart or shredded and there are no loose threads or anything like that. It's nice and light in the summer and adds extra warmth under our quilt in the winter. It's a great value. I received this blanket as a gift. I washed and dried this king size blanket. When I put it on my bed it had shrunk to the size of a full size bed. I am very upset and disappointed . How do I explained this to my daughters who gave this to us. NO WHERE DOES IT SAY DO NOT WASH OR DRY. Super soft and the color is gorgeous! I live this blanket. Perfect for under a lighter quilt/comforter. They run big and are easily tucked under our mattresses. There was a tremendous amount of loose fuzz when we opened the package and the lint trap in the dryer required frequent emptying due to the fuzz. Even as we put it on the bed the lint continued to fly. We had to vacuum it up. The blanket appears to have lost some of its pretty color with washing even though we followed directions exactly. Had for a year when washed looks like new. Love the easy care. Washes well. Comfortable to snuggle in. I have 2 on my bed, they are warm enough in winter. I like that they are cotton, because synthetic fabrics often get static and make you sweaty. Cotton is so much better in that regard. The colors stay true, no fading. Gladly give these 5 stars. Best all seasonal blanket!! Washes up and dries nicely. I bought this a few months ago and it has held up pretty good. I have washed it a few times so it does have a few frays. It is a monster to wash though! "Do you have a light weight twin size blanket in bright yellow?" The "lemon" option is the only yellow available. "Is the twin throw same as a twin size blanket?" The twin blanket is 60 x 90. "I saw from an earlier answer the King size is 9 pounds - that seems heavy for a throw blanket - can you verify 9 pounds was correct?" Quality blanket, much warmer than those flimsy blankets that do not really create a warm sleeping comfort. I have a queen size and not a king, but a find it a hard to believe it would weigh 9 pounds.My husband didn't believe that either. It is heavier than what I would consider to be a normal thermal blanket. I am very pleased with the quality of this blanket. I would highly recommend this blanket to anyone. I have washed mine 3 or 4 times (I have a dog). I washes up very nice and has not shrunk at all. It looks like new. Hope this helps. "Is the lemon yellow color bright or a pale soft yellow color"
the color is more of a pale yellow. "Is "Pearl Blue" in the item choices the "Light Blue" in the pictures?" "I did not purchase the powder blue, but I did purchase the navy blue. I would not recommend this blanket. It was a not what I expected and the quality was not good as well. Looked great in the package, but honestly I got rid of the blanket. It did not even keep me warm as I tried to use it on a cold night. I hope this help.."
"are these blankets machine wash and tumble dry warm? are they pre shrunk?" Yes you can machine wash and dry. Don't put other items in with them that might pull the treads in the blankets. Not sure they are pre-shrunk, but the shape didn't change after washing. I always wash my bedding's before laying them on my bed. Did it shrink? NO! I love my Grand Hotel Woven blanket! "How much does the king sized blanket weigh?" I don't have an exact weight on it but it is the perfect spring blanket Not to heavy but weighty enough to be able to feel you have a blanket on. We are happy with our purchase - it covers the bed nicely.